"I Love To Go Boating!" 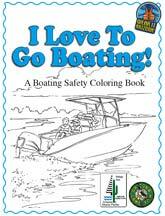 Coloring Book: Kids have a blast coloring in these fun pictures while learning about boating safety! Written by Mia LaBarbara, Arizona State Parks Interpretive Education Planner, with illustrations by Jennifer Wood. Produced in cooperation with Arizona Game & Fish . Download and print your copy today! Help keep your parks beautiful! 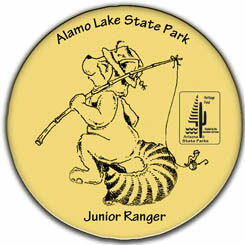 If you're between ages 6–12, you can become a Junior Ranger at Alamo Lake State Park! Pledge to do your part to help the parks so everyone can enjoy them! Start by downloading and completing the Junior Ranger Activity Sheet below to learn more about the park! Then bring it with you to the park when you visit and you'll be on your way to becoming a Junior Ranger. When you visit the park, ask for a full Junior Ranger booklet at the Visitor Center, Ranger Station or office. Complete the activities during your visit and then bring it to a Park Ranger for review. If the ranger approves, you'll be asked to take the Junior Ranger Pledge and get sworn in as our newest Junior Ranger! You'll also be given a Junior Ranger Button! We hope to see you at the park! Fish Scramble: There are many different types of fish in Alamo Lake. Unscramble the following words to discover their names. Discover Rocky Ringail's secret message when you write the letters in the numbered boxes in the boxes at the bottom of the puzzle with the same number! Remember, you can become a Junior Ranger at nearly all Arizona State Parks. So explore our website and visit the FOR KIDS page for each park for more activities! Junior Ranger Button: Show everyone that you're a Junior Ranger! After you complete your activities and take the Junior Ranger Pledge, you'll receive a Junior Ranger Button. You can pin it to your pack, put it on a bulletin board, or wear it proudly wherever you go!